A kayaker in New Zealand testing out a newly launched camera captured amazing video of a seal whacking a fellow kayaker in the face with an octopus. Taiyo Masuda told NBC News the group was on a GoPro-funded kayaking trip off the coast of Kaikoura on New Zealand’s South Island to test the company's new Hero 7 Black camera on Sept. 22. Masuda said around lunch time, the seals began to swim around them looking for food. 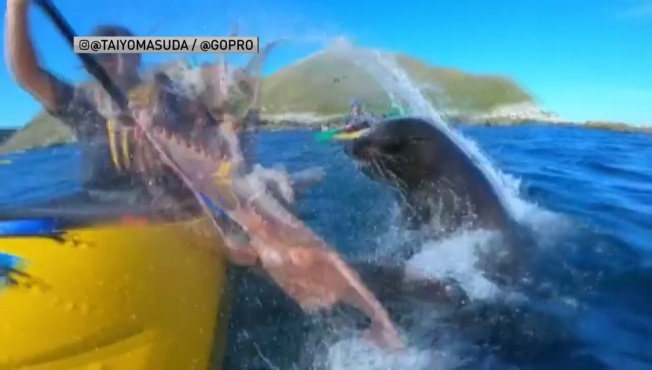 "One seal swims right next to us, having an octopus in his mouth, pops right up off the surface next to us, then tries to chew up the leg but ended up slapping our face," Masuda told NBC. Video shows the seal springing out of the water with the octopus clutched in its mouth, and then clobbering kayaker Kyle Mulinder in the face with its lunch. "That was mental," Masuda can be heard saying in the video. Masuda told NBC the raw moment brought the group a lot of laughter all day long and the day is one they'll never forget. "I’ve never had such an amazing kayak everrrrr!!" Masuda wrote in an Instagram post of the video.